Hello my dears! This is the start of a 'Guest Post' series that I'll be doing for a week or so. My nails are going through a horrendous ugly phase right now :( so I figured it was a good time to share with you some posts from my wonderful blogger friends that I love and admire! Please take a minute to check out their blogs if you like what you see, which I know you will! This post is by my gorgeous friend Kisten from Polish Pauper, enjoy! Hey lovelies! I am super honored to do this guest post for the la la lovely Kellie! Butter London is one of my favorite brands so of course I had to pick up Bluey from the new fall collection. 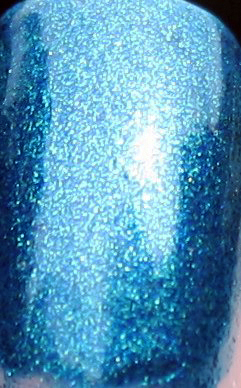 Described as a slightly metallic dark peacock blue, this one is gorgeous! Shimmery, glowy teal/blue goodness! My only complaint is that the formula was a little thin, but after two coats it was perfection. This is my typical combo, RBL prep, Butter London Horse Power, 3 coats of Bluey then SV. On a side note, Butter London uses British slang or terms for the names of its polish, which is hysterical, check it out here! On that note, thank you to all of you la la lovelies! Ta! Til next time, thanks for reading guys n' dolls! Illamasqua Theatre of the Nameless: Sneak Peek! OPI Muppets Holiday Collection: Sneak Peek!